On what was considered a cold night for Los Angeles, fans walked down the rained-over streets to catch the opening acts for Fucked Up. Narrow Head only brought in a small audience but played as though they’d sold out the venue. After a short break, Big Business took the stage and blasted their first track, successfully managing to bring in most of the stragglers from the outdoor area of the Echoplex. A relatively large amount of people stood by after their set to wait for the main act. The Canadian punk band Fucked Up recently released their album Dose Your Dreams after a hiatus. It’s considered one of the poppiest and most experimental albums of their nearly two-decade-long career. Fucked Up took the stage shortly after their scheduled time of 11:00 pm. The many band members, several guitarists, a bassist and the drummer played for about two minutes before the main singer, Damian Abraham, came out to scream the lyrics of the track, “Dose Your Dreams.” Abraham’s only instrument is his voice, but he had a great time swinging around and catching the mic while headbanging along with the crowd. Some light moshing began almost immediately after he ran onto the stage and a lone crowd surfer appeared. The band had a tendency to play two songs back to back so that they blended together, leaving an unfamiliar audience member unsure when one song ended and the other began. Other tracks such as, “Raise Your Voice Joyce” and “Queen of Hearts” kept the crowd dancing and on their feet, even when the mosh pit and crowd surfing increased. 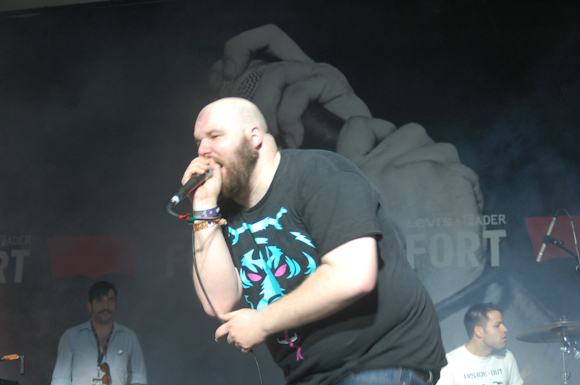 Abraham frequently got as close as possible to the crowd and shared his mic with the audience, which included the lead singer of Big Business, who towered over many of the others in the front row. He came off as extremely playful and fun, especially when he crushed a plastic cup on his head and left it there for the duration of several songs. A heartfelt moment came about halfway through when Abraham opened up about the losses he’d faced this year and even spoke about how unfortunate it was that people he cared about had lost their lives during a dark time in society. He ended the speech on a hopeful note, stating that he wanted to believe things would improve with time. They continued the set with a few more tracks like, “Under My Nose” and “I Hate Summer,” in between which Damian passionately called out the “phobias” and “isms” plaguing the world of politics and more. The fan-favorite tracks came toward the end, as in most shows. Fucked Up closed out the show with “Accelerate” and “The Other Shoe.” The Echoplex, which is located underneath The Echo in LA, was a perfect venue for a crowd like this. It was spacious enough to accommodate the rowdier members as well as those who preferred the calm of the sidelines.